Tune in Slabbed Nation. Nungesser and Jindal’s sand berm scheme is unraveling and people have noticed. Dishonesty is the fundamental component of a majority of offences relating to the acquisition, conversion and disposal of property (tangible or intangible) defined in the criminal law such as fraud…Intellectual dishonesty is dishonesty in performing intellectual activities like thought or communication…the conscious omission of aspects of the truth known or believed to be relevant in the particular context. 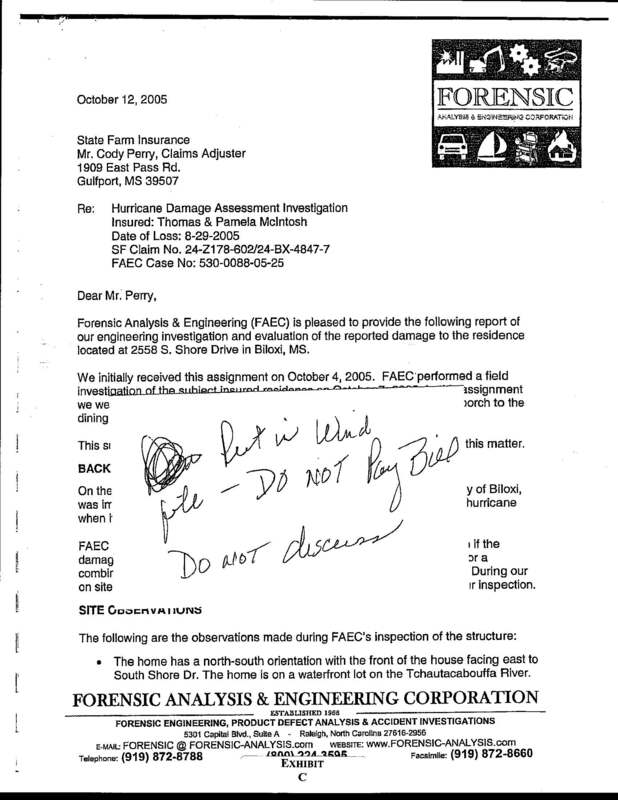 When the Rigsby sisters discovered Lecky King’s “Put in Wind file – Do Not Pay Bill Do not discuss” handwritten note stuck on the face page of engineer Brian Ford’s report on Katrina damage to the McIntosh property, it became the “face” page, one might say, “that launched a thousand” Katrina policyholder claims into court. More recently, it launched State Farm’s counsel into an intellectually dishonest representation of related evidence to the Court. First good news in almost 90 days. Hopefully it holds and we can move on to cleaning up this environbmental nightmare. Author Posted on July 15, 2010 Categories SopTags BP, Gulf Oil DisasterLeave a comment on Oil spill stopped?